If the answer wasn’t in the title of this article, it would probably be a moderately difficult riddle to solve; especially for expats! It is of course the typically Dutch Frysian “Elfstedentocht” (freely translated: eleven city tour). Then again, now that you have had the time to think about it, you may remember the media hyping over the possibility of an Elfstedentocht happening back in February 2012. Granted, it has been a while since the last Elfstedentocht. But, considering that most young adults could just about walk – let alone skate – when the tour was last held and the fact that only 16,000 people, all of whom are members of a semi-elite club, are allowed to enter the tour, it remains remarkable that the discussion in February 2012, on whether or not the Dutch were to witness another Elfstedentocht, almost resulted in a national riot. So what is the Elfstedentocht really about, exactly? The Elfstedentocht is held in Friesland (that Dutch province where they speak a language even most Dutch people do not understand) and, as the name suggests, it is a tour that passes eleven Frysian ‘cities’ (villages, more like; most are called cities only because they received city rights a long time ago). The total length of the tour varies every time, but is usually about ten kilometres short of 200 kilometres. Oh, and the entire track is to be covered on ice skates, on natural ice, on canals, streams, rivers and lakes. Madness you say? Nay, Frysians. How, what, why? Well, long before there were cars and bicycles, Frysians that wanted to travel across Friesland in winter and arrive before that winter was over really only had two options: either travel by horse or by ice skates. And since horses cost a lot of money, most ‘opted’ to skate. But do not be mistaken: it was tough going. So if you weren’t tough enough to skate and had no money, you had to either get tougher or make money. Naturally, the thing to then do is to challenge the tough people to a bet they can’t possibly win: to skate past all Frysian cities in one day. As they had no chance of making it, you were sure to get a good payday and buy that horse you’ve been craving. I must be joking, right? Actually, no. There’s a source dating as far back as 1749 that makes mention of a man named Pier who passed by eleven Frysian cities on skates, in one day. Later, in 1890, someone named Pim Mulier decided to also try skating past eleven Frysian cities. Some years later he played an important part in founding the organization that organized the first Elfstedentocht in 1909, and the winner of the Elfstedentocht receives the Pim Mulier-trophy to this day (well, 17 years ago, really). Which brings us back to the riddle at the start of this article: the Elfstedentocht really only took place fifteen times in the past 115 years. And it has been 17 years since the last one. The biggest gap between tours was 22 years, though, so there’s still hope, right? The reason there have been so few tours is that there are certain (safety) conditions that have to be met: the ice has to be at least 15 cm thick along the entire track of the tour. In addition, all “Rayonhoofden” (22 Elfstedentochtdistrict heads) have to give their consent, which they do not do lightly, as they are basically held responsible for the ice in their district, so they must also factor in things like the weather forecast for the day of the tour. But even when those conditions are met, there remain parts of the track that have thinner ice, for example under bridges. Those areas of the tour the skaters have to cover while ‘walking’ on their skates, in Dutch called “klunen”. 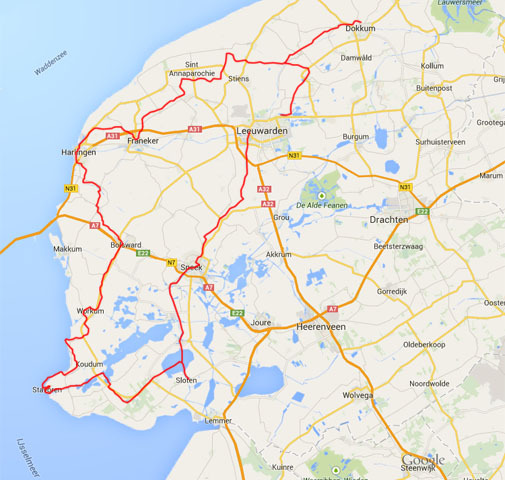 Below you can see the track of the Elfstedentocht from 1997. The eleven ‘cities’ are: Leeuwarden, Sneek, IJlst, Sloten, Stavoren, Hindeloopen, Workum, Bolsward, Harlingen, Franeker and Dokkum.